So when, the state cuts spending, that spending cut reduces demand. Importantly, it does not merely reduce demand by its own value, it reduces it by its value times a multiplier. Why? Well, when the state reduces spending, all of the various people who would have supplied the state’s demand receive a reduced income. This results in a reduction in their subsequent economic activity. Say the state was building a bridge, but then a government of austerity-proponents takes power and cancels the bridge project. It is not merely the bridge contractors that do not receive money, it is whoever the bridge contractors would have given that money to, and whoever those people would have given that money to, and so on. There are misery ripples. So, when the state reduces spending by 1%, the change in economic output for the entire economy will be 1% times a multiplier. Now, in good economic times, that multiplier can be very small, even smaller than 1, because of the potential for the state to have been crowding out strong private investment. For this reason, pre-2008, it was generally believed that the multiplier was only 0.5. In the aftermath of austerity, however, new work on the multiplier has been done. The IMF has concluded that, under depressed conditions, where there is insufficient private investment and crowding out is impossible, the multiplier is much, much higher–as much as 1.7. So suddenly, a reduction in spending by 1% of GDP can produce a 1.7% contraction in the size of the economy instead of merely 0.5%. Instead of eating at the savings a little, as was previously thought, the contraction is so large that it eclipses them. 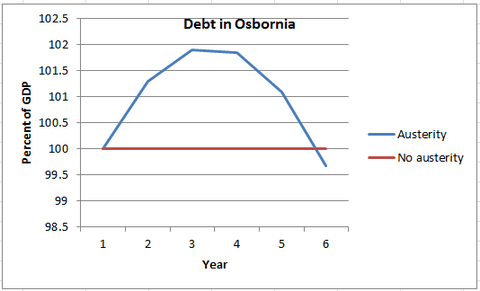 As we can see, over the five years the debt position of Osbornia actually worsens before coming back to the baseline, the conditions that would have prevailed without austerity. By the end of Krugman’s simulation, Osbornia is in the same debt position it started in, but with an economy 6.5% smaller. Perversely, in 2011 and 2012, Chancellor Osborne actually passed austerity packages larger than 1% per year–they were around 1.6% (though some of that 1.6% was tax increases rather than spending cuts, and there’s some debate over whether or not tax increases impose multipliers of the same size–perversely, those who support spending cuts had better hope the left are correct and tax increases are less impactful, or the multiplier will have done very nasty things to Britain). By the same token, the US has about a 1.9% austerity package on the books for 2013, though again, a portion of that is composed of potentially less impactful tax increases. While neither Britain nor the US have embarked on a 5 year plan of strangling their economies, these individual years could potentially have worse effects on both the economy and the debt position than those illustrated by Krugman’s Osbornia. But this isn’t the only news on debt and deficits out recently–the CBO has got a new report too. The new report estimates “automatic stabilisers”, the amount of additional spending imposed on the government by the weak economy in the United States combined with the estimated reduction in revenue that results from depressed output. Their result? In 2013, $422 billion of the government debt consists entirely of stabilisers. This means that, with a recovered economy, the deficit this year would amount to a mere $423 billion. This does not wipe out the deficit in its entirety, but that is not the goal. The goal is a sustainable debt to GDP ratio, which means that if the economy grows faster than the debt increases, the fiscal position of the state improves. Currently, total debt is around $11.5 trillion. If we want to keep that debt stable, we need the deficit to be smaller than growth. Krugman suggests that if we expect a growth rate of 2% and an inflation rate of 2% once the economy recovers–conservative estimates if history is a guide, as both figures are usually somewhat higher–a sustainable deficit would consequently be 4% (the combined growth and inflation rates) of the debt total. 4% of $11.5 trillion is $460 billion, which means our underlying $423 billion deficit is sustainable as it stands with no austerity required. Perversely, stimulus to recover the economy could well reduce the deficit and improve the long-run debt position. But that’s not all–with all the austerity congress has planned this year, by 2014 the CBO projects a rise in the automatic stabilisers with a corresponding fall in the underlying gap. Once we take out the automatic stabilisers for 2014, the remaining deficit is a mere $172 billion–far, far in excess of the figure necessary for a sustainable debt position ($460 billion). So not only are no more spending cuts necessary for a sustainable debt position, but the spending cuts we have had are already more than are needed. Put the IMF and CBO together and you get something really mad. We’re trying to cut spending to bring down debt and deficits when doing so will result in a reduction in growth rates and an increase in the automatic stabilisers for which the state has to pay. It would be much, much easier to just grow the economy and get the stabilisers out, so why aren’t we doing it? Because not only do the people not understand this, but the people the people elected don’t understand this. It’s an ignorance trap, and it’s keeping us in a liquidity one.